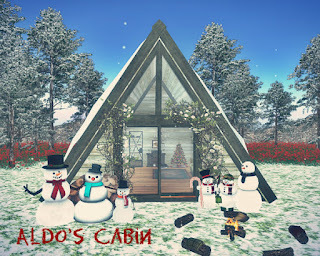 Every end of the year I try to build a low prim house as a gift and this year I've made Aldo's Cabin, a single room A-Frame Cabin. Aldo's Cabin, named after my Le Tigre Bengal Menagerie KittyCat is only 9 land impact with a 12 by 12 base. Above is a picture of the cabin all decked up in winter season with snowman and snow. 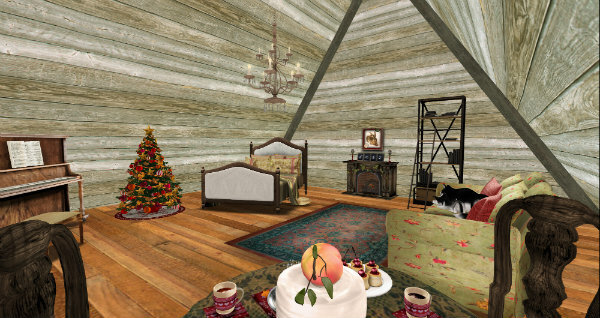 The cabin is actually unfurnished with no snow add-ons. Once winter is over, this cabin would be perfect next to a beach and anywhere you want. It is big enough for 1 person as you can see in the picture above. Aldo's Cabin is TRANSFER ONLY. It's not on the marketplace but you can get it at my in-world store.